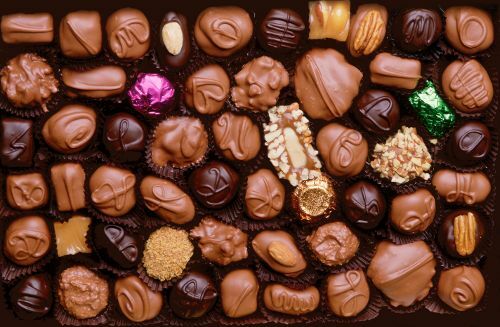 You know it's going to be a good day when you receive an email asking if you'd like to review chocolates. Ummm....yes please! 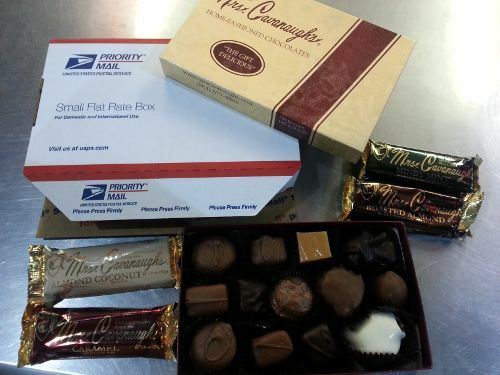 Mrs. Cavanaugh's Candy Co. is one of those stories that we like to hear. How one woman took an old family recipe, put her own spin on it, and with the encouragement of friends and family turned it into a business. A business that is still going strong decades after it began. I know, that's a nice story but how do they taste? After some grueling research painstakingly undertaken by Engineer, our neighbors, and myself, we can give you our honest opinion...they are great! Mrs. Cavanaugh uses fresh cream and butter and no preservatives! For dessert one night, we carefully cut each chocolate into fourths and tried them all - for research purposes obviously. "Not stale like other boxed chocolates"
"The chocolate is very smooth and creamy"
"The 'Mindy Mint' has a beautiful texture"
" I could eat a box of these by myself!" "The caramel is lovely, and I don't like caramel"
"The cherry cordial has a strong cherry flavor"
"Oh, that white chocolate!...nom nom nom"
"I'm not into creams, but that raspberry cream is yummy"
"They are a little difficult to distinguish which is which from the picture"
Chocolate with no preservatives? I need this!